Chocolate covered pumpkin pie bites! Looking for a unique fall recipe to make for Thanksgiving week? How about dipping pumpkin pie squares in chocolate chips to create these mouth-watering Thanksgiving Chocolate Covered Pumpkin Pie Bites? Entertain your guests with these sweet bites from taste of Lizzy T.
Chocolate=Happiness, right? And not just chocolate, but special Thanksgiving chocolate covered pumpkin pie bites. 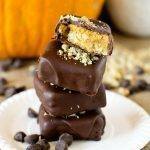 If you have pumpkin and chocolate lovers in your family, make these for them this Thanksgiving holiday. After all, wouldn’t your guests love to munch on these while the turkey is baking?